Dubai, UAE, January 24, 2019: With the New Year upon us and many making resolutions for their individual hopes and goals for the year ahead, one resolution that remains as popular as ever is looking after ourselves better and taking care of our overall wellbeing. With this in mind, Amphis Beauty may be exactly what you are looking for to naturally tackle the effects of ageing on the inside, whilst improving and beautifying the skin, hair and nails on the outside. A daily ritual made up of ingredients from the finest marine sea plants and natural compounds, Amphis allows you to simply use nature to deal with a natural process. 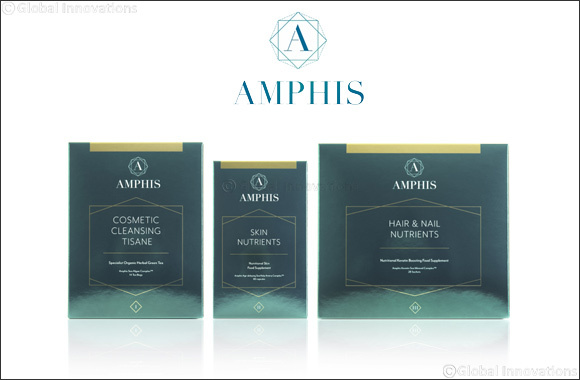 If you are looking to strengthen your hair and nails in as little as two weeks, Amphis Hair & Nail Nutrients (AED 399) are an oral sachet, taken daily that accelerate the growth of strong, lustrous hair and strengthen nails by using a keratin boosting liquid that delivers marine actives which work from the inside out, using vitamin-enriched sea minerals from the ocean, the worlds most powerful natural resource. The Amphis Hair & Nail Nutrients are the first nutritional keratin boosting liquid on the market. With a unique orange flavor, this food supplement contains a unique formula called Amphis Keratin Sea Mineral Complex. This is what accelerates the growth of stronger hair and strengthens the nails, with each sachet containing a host of nutrients including calcium, silicon, iodine, Vitamin C, Beta Carotene, Vitamin B6, Vitamin B2, Biotin Selenium, Vitamin D3, Vitamin B12 and Vitamin B3. Amphis Hair & Nail Nutrients sachets have been shown to work as early as two weeks. The other two Amphis products that make up the Amphis ritual include the Skin Nutrients (AED 399) which are two capsules taken daily and the Tisane (AED 147) which is an organic herbal tea that cleanses the body from within. Each product can be used individually or for best results, as part of the daily Amphis Ritual as each plays a specific role. Amphis is available from January 2019 at pharmacies across the UAE and online at BasharaCare.com for online GCC and KSA orders.